The US oil and gas sector is a major contributor of investment into greenhouse gas mitigation technologies, according to a new study commissioned by the American Petroleum Institute (API). Between 2000 and 2016, oil and gas companies alone invested a cumulative $108.2 billion in technologies aimed at reducing greenhouse gas emissions from a variety of sources. Notably, that total doesn’t include an additional $193.3 billion invested in emissions-lowering shale gas, which the Energy Information Administration and other reputable third-party sources have largely credited for the 13 percent drop in U.S. energy-related carbon dioxide emissions since 2005. 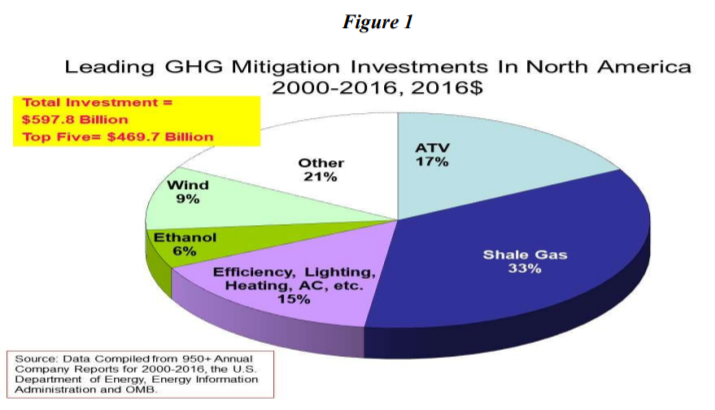 Key Investments in Greenhouse Gas Mitigation Technologies, conducted by T2 & Associates, recorded a total of $597.8 billion was invested into emissions reduction technologies by entities across the United States from 2000 to 2016. Of this total, the oil and gas sector was the biggest overall contributor, followed by the federal government ($152.7 billion) and then the rest of the private sector ($147.6 billion). According to the report, these investments in total were spread across three areas. Shale gas technology was the target of 33 percent of the total investments made from 2000 to 2016. Advanced technology vehicles (ATV) that relied on propulsion from sources other than gasoline or diesel saw 17 percent of total investments. Another 15 percent was spent on improving efficiency for lighting, heating and air conditioning technologies. Nine percent was invested in wind energy innovations, and six percent on ethanol. The remaining 21 percent was spent on various other technologies. These investments have certainly garnered good returns from an environmental perspective. Total US CO2 emissions during 2016 were 14 percent lower than in 2007, when they had previously peaked. The report outlines how these investments have made an impact by reflecting on the state of the environment and the economy in 1990. In 2016, CO2 emissions were just three percent higher than 1990 levels, while in 2007 they were 20 percent above 1990 levels. Remarkably, this decline in emissions through 2016 occurred during a time of economic and demographic growth. Since 1990, the United States population has grown by 20 percent, adding 73 million people through 2016. Furthermore, U.S. gross domestic product (GDP) increased by 87 percent during the same period. As EID has noted numerous times, this trend of economic growth along with declining emissions is unprecedented. It’s truly amazing that we are sustaining an economy that is 87 percent larger than the one we had in 1990, with an additional 73 million people, with just three percent more CO2 emissions. But even more extraordinary is the fact that our nation is on pace to see its emissions drop below 1990 levels in the coming years, while continuing to experience economic and population growth. That kind of development would not be possible without the immense contributions from domestically produced natural gas, along with sources of renewable energy, much of which relies on natural gas as a backup. Thanks to the combined technologies of hydraulic fracturing and horizontal drilling, US energy companies have been able to economically recover vast resources of natural gas across the country in the past decade. This resurgence in domestic natural gas production has made the product more affordable than other sources of higher-emitting fuels. Because it is cheaper than other traditional fuels and emits far less CO2 when burned, many electrical utilities have shown a preference for using natural gas in recent years to produce power throughout the country. This trend has helped countless states and localities meet their environmental goals for reducing air pollution and greenhouse gas emissions. 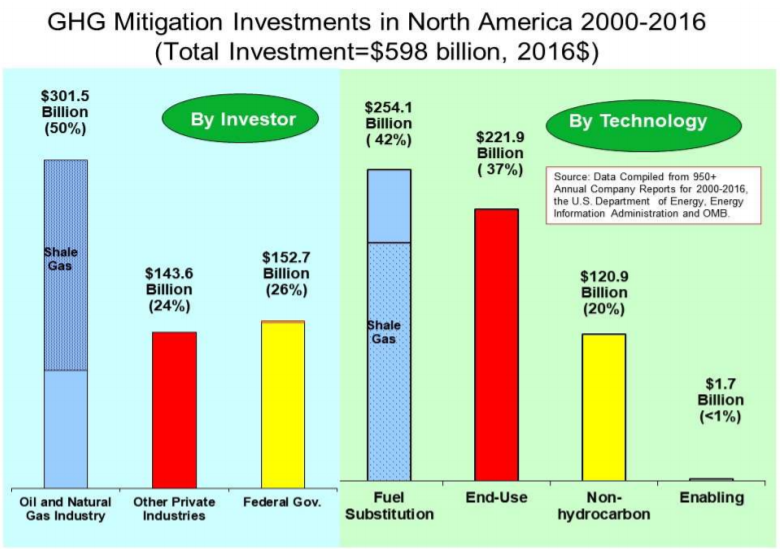 Overall, API’s study shows that $1 out of every $6 invested in renewables and other nonhydrocarbon technologies in the United States since 2000 has come from the oil and gas sector. We can certainly expect that level of investment to continue, if not rise, in America’s energy future.